International Monetary Fund Chief Christine Lagarde's Negligence Trial Begins : The Two-Way Lagarde, who appeared in court in Paris, is accused of negligence in connection with her oversight of a 2008 case when she was France's finance minister. She has led the IMF since 2011.
International Monetary Fund chief Christine Lagarde arrives in court on Monday. She is accused of negligence in connection with her oversight of a 2008 case when she was France's finance minister. The head of the International Monetary Fund appeared in a Paris court Monday for the opening of her trial over alleged negligence during her time as France's finance minister nearly a decade ago. 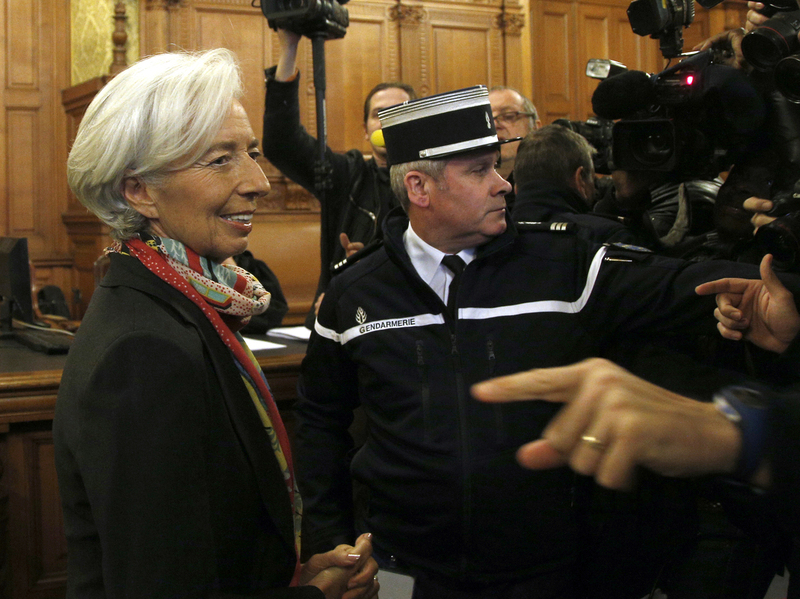 Lagarde appeared before France's Court of Justice of the Republic for the first day of hearings, the BBC reported. The court handles cases related to alleged misconduct by government officials. "Lagarde, then the finance minister, referred the matter to an arbitration panel, which decided in Tapie's favor, awarding him $527 million [more than 400 million euros]." As NPR's Eleanor Beardsley reports from Paris, "Lagarde, who is accused of succumbing to political pressure, says she may have been unknowingly negligent, but did nothing wrong and did her job as best she could at the time." Last year, according to The Wall Street Journal, "a Paris court ordered Mr. Tapie to repay the damages on the grounds that a judge in his arbitration case wasn't impartial." "A conviction could place both Ms. Lagarde and the IMF in a bind. In July, the fund renewed her as managing director. In France, the charge of negligence by a public official that results in a third party misappropriating or purloining state assets is punishable by up to one year in prison and a fine of up to €15,000. "Ms. Lagarde's legal team intends to file a motion to stay the proceedings on the grounds that the alleged misappropriation of assets is still subject to a separate investigation. If judges allow the trial to proceed, Ms. Lagarde is expected to testify and a ruling is due in seven days. "A conviction wouldn't necessarily mean the IMF would have to eject Ms. Lagarde from her post ... 'The Executive Board has been briefed on recent developments related to this matter, and continues to express its confidence in the managing director's ability to effectively carry out her duties,' IMF spokesman Gerry Rice said."